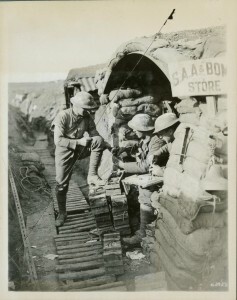 The trench warfare of the Western Front resembled a siege, where enemy forces, shielded by trenches and fortifications, were difficult to see or to shoot with direct-fire weapons such as rifles. In close quarters fighting, especially in trenches, it was also difficult to inflict casualties on the enemy without exposing one’s self in order to fire. In attempting to fight through enemy trenches, or to defend against attack, all armies came to rely heavily on grenades. These simple, hand-thrown weapons had been invented hundreds of years before, but had not been widely used since the Napoleonic era. Reinvented by the requirements of trench warfare, the first grenades in 1914 were often hand-made, consisting of old cans filled with nails and bits of metal and packed with gunpowder. They often proved as dangerous to their makers as to their intended targets, due to the risk of premature explosion. By the end of 1915, all armies were being supplied with hand bombs. Rifle grenadiers fired specifically modified grenades from rifles, while the infantry on both sides carried dozens of different types. 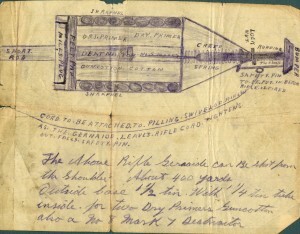 The Germans tended to prefer the stick bomb, which could be thrown farther but had a smaller explosive charge. 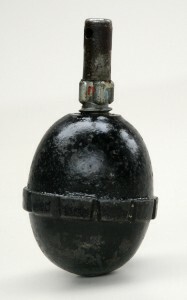 The British and Canadians used egg-shaped hand grenades, which could be thrown about 30 metres (10 metres fewer than the German sticks), but carried a larger explosive charge. By 1917, all infantry carried grenades. 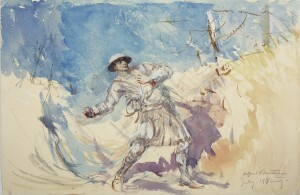 All major assaults required attacking troops to carry extra grenades to capture their objectives and then hold them against enemy counterattack. 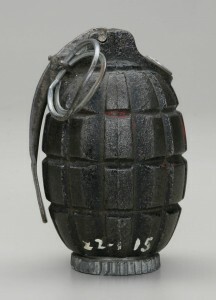 This grenade, also known as a Mills bomb, was one of the war's most effective infantry weapons. It was first issued to troops in the spring of 1915. After pulling the safety pin, the thrower had about five seconds before the grenade exploded. Generally lethal within a ten metre radius, the explosion sent pieces of metal up to a range of 200 metres.